I try to bake bread at least one if not two days a week, on my days off. This past week I baked 6 baguettes on Tuesday, and three sourdough baguettes on Wednesday. I saved enough dough from the sour dough batch to make a pizza. I know I have mentioned it before, but giving the dough a chance to develop over two or three days really does make for a superior crust. The crust is so good it becomes the star of the show needing nothing more than a few simple toppings. Last night's pizza was topped with just sauce, Bocconcini cheese (fresh mozzerella balls) and I had a few mushrooms that I needed to do something with. Sliced thin and sauted they were all we needed. Our local pizza place does make pizza as delicious as this. This is just jump-up-and-down, I-can't-possibly-wait-one-more-second for-a-bite-of-this GOOD. mmm..adoro la pizza!! molto invitante!! Oh, heaven! Just what I need today - when I am vegetarian! Gosh this looks good...so much better than anything I see locally....can I come over for a visit? Wow...so nice...the photos really do it justice! Great looking pizza! 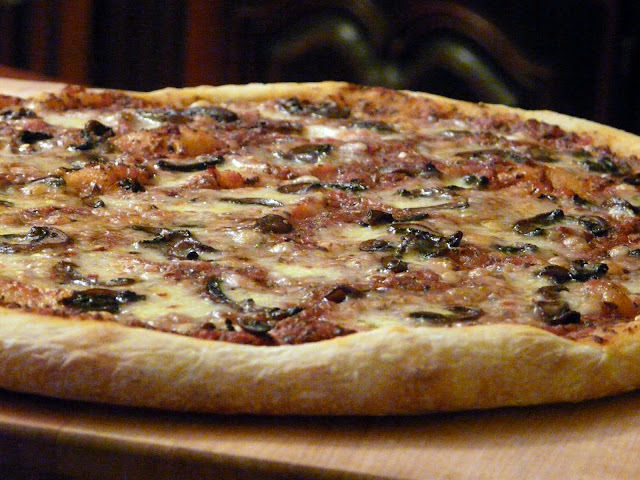 Homemade pizza is really hard to beat- I'd love a couple of slices of yours! oh wow.. looks incredible... as always..
Gorgeous Pizza Ann! That crust really does steal the show, I would love that combination of toppings, too. Another stunning pizza, Ann. I've been following along with your combinations and suggestions for several months and my pizzas have enormously improved. My family thanks you. Perfect! I love thin crust! Cathy, Thank you, I love this kind of feedback. 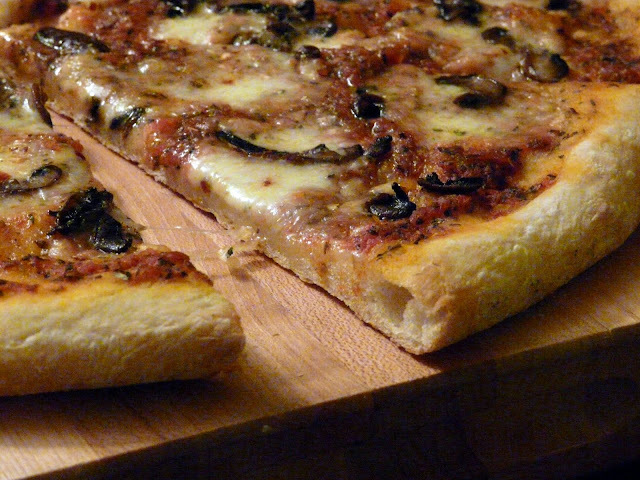 pizza looks amazing, but I looked on your site and cannot find the recipe for the dough? Anonymous, I make my pizza crust out of a couple of different doughs, depending on the bread I've made that week. Julia Child's Baguette dough makes a wonderful pizza crust, especially if you make the dough a couple of days in advance. I knead up enough dough to make two or three baguettes and enough for a large pizza. 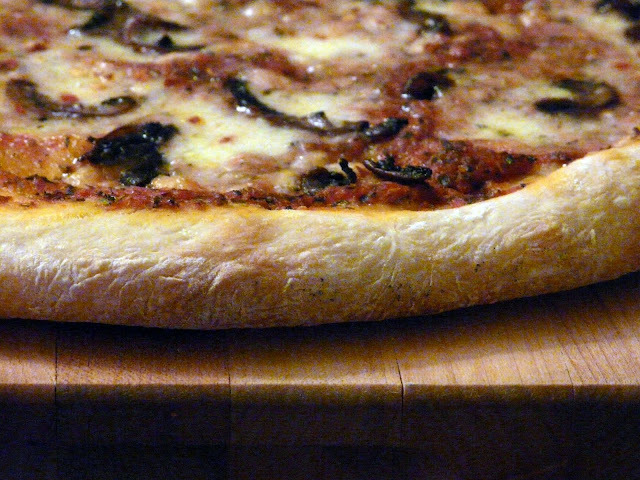 The pizza dough can be left in the fridge for up to 2 to five days. The longer the fermentation the better the crust.